We are talking all things Mole today. Have you ever had Mole? It’s a traditional Spanish dish typically combining a tomato-based sauce with chiles, spices, nuts, seeds, and (are you ready for this?!? )… chocolate!!! It is incredibly flavorful and delicious, but can be quite time consuming and the list of ingredients can be a mile long. So, this is Pulled Pork Mole simplified. Serve it up warm with all the fixins at your next fiesta! It feeds a crowd and no one will leave hungry. Optional for service: warmed corn or flour tortillas, bibb lettuce leaves, sour cream, cheese, lettuce, tomatoes, jalapenos, lime wedges, chopped cilantro, olives, etc. 1. Stir together the prepared salsa with all the spices and cocoa powder. 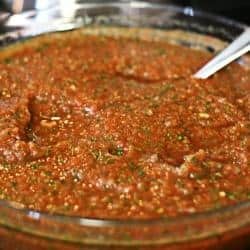 Pour some of the salsa mixture in the bottom of your slow cooker. Place the meat in a 4-6 qt. slow cooker and top with the remaining sauce. 2. Cook on high for 4-6 hours until the pork is cooked through and is easy to shred. 3. Remove the meat from the slow cooker, shred, and return to the sauce. Simmer until ready to serve. 4. Serve with warmed flour tortillas, cheese, sour cream, lettuce, tomatoes, onions, peppers, olives, etc. But my favorite way to serve? As a lettuce wrap. 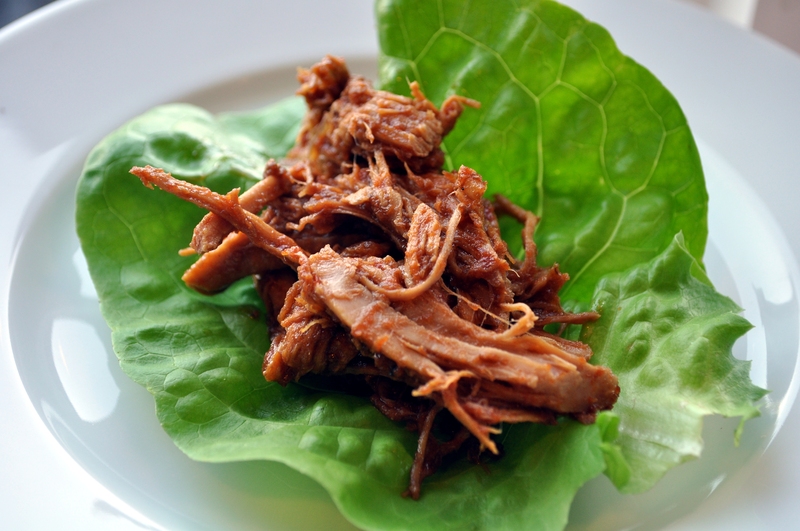 Plop a healthy amount of the meat down the center of a crisp Bibb lettuce leaf, top with some hot sauce, a sprinkling of Manchego cheese and a tear of cilantro. Mmmmm….. Making my mouth water just thinking about it. There is nothing quite like a black ensemble. At least for me there isn’t. I am literally someone who, when filling out a quiz or personality assessment, and it asks your favorite color, I consciously choose green over black because I am afraid what selecting “black” would mean… does that mean I have a sinister side? But, I do love black. In fact, more than half my closet is filled with black tops, pants, skirts, shoes, dresses, and handbags. You can never go wrong with black. But, some have difficulties styling an all black ensemble. And, truth be told, there is an art to it, but not a complicated one. The all-black look is classic, timeless, and appears effortless. It’s flattering and slimming and looks glorious on almost every single skin tone and with all hair colors. It can be worn in all seasons, for all occasions, and for all times! So, who wouldn’t want to learn how to rock black? While creating the all-black-look, try to incorporate a variety of textures and different materials.Oftentimes all-black can look one-dimensional and rather flat, so playing around with texture can add a playful mix and interest to your overall look. Wearing all-black can sometimes look and appear really heavy on your figure, however, styled correctly, it can work wonders and be very flattering and slimming. Try varying the fit and tailor of each item to enhance your natural body shape. The rule of thumb is to mirror your top & bottom, and pair “opposites.” So, for instance, pair skinny jeans with a loose, cable knit sweater or silky kimono, and wide leg trousers or full A-line skirt with a more fitted top or jacket. Do not be afraid to show *a little bit* skin. It breaks the monotony of the look by pairing an all-black outfit with open-toed shoes, sheer or lace details, cut hem jeans, a tasteful slit in your pants or skirt, or a sleeveless or off-the-shoulder shirt or dress. It’s okay to break the rules a little bit, so add a pop of color with your choice of accessories. Maybe a colorful handbag, shoes, or even a printed scarf or clutch. And, no one can ever deny a great pair of sunglasses or a bright-hued lipstick! If it needs a little something extra to punch it up a bit, just punch it! 5. Black is Blank Canvas, so Be bold! Styling an all-black-look is like looking at a blank canvas, and it happens to be the perfect excuse to experiment with bold and eye-catching accessories. Add statement jewelry, a great belt, or even a great, structured jacket. Before you know it, you will be wearing black like a pro! So… What’s your favorite way to wear all-black?! ?